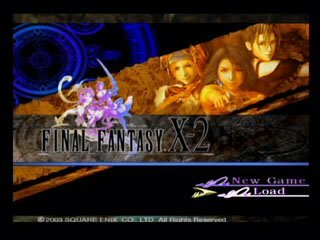 Released in November 2003, Final Fantasy X-2 was a shock to the fans by being the first Final Fantasy game which is a true sequel. Yuna comes back with a whole new attitude and attire as she searches Spira for clues of her lost companion. Note: Real time is used for New Game+ runs since the ingame timer does not behave accurately. Best time: 4:09 by Mike 'darkwasabi' Janiak on 2006-01-23. Best New Game+ time: Single-segment 2:48:47 by Emma 'Augora' Rice on 2014-05-08. 4:09 by Mike Janiak, done in 19 segments. My first speed run on SDA, yay! First I'd like to than Radix for making this awesome site. Nate, for the great compression guide. All the people in the Tech Support forum helping me out. Ventuz for giving hope that the game can go sub 5, which I probably would have never even done this without. KADFC for his Speed FAQ on Gamefaqs, which I used a lot to compare times. And all the people who gave support in the forums, it really helps. When I first wanted to do a run of this game, my hope was shot down when I saw that there was a Speed FAQ of X-2. I looked through and lost almost all ambition to even attempt a run of this game because it seemed so flawless. A long time later Ventuz made a topic and said he had a time of around 5:40 at the last save with not too much planning. This sparked an interest to see if 5 hours could be beaten while using a different strategy than the one in the FAQ, because my intention when I first saw the FAQ was to just follow it. After only about a week, I started and completed my first speed run for this site while beating KADFC's record by 51 minutes! Not to say it was an easy task, very much the opposite. Charon is an attack that does double the user's max HP. So I had to get both my girls up to level 22 to have at least 2500 HP to do max damage. This is why I refrain from using it with two girls in the beginning. The run is not perfect, some things could have gone better. But I don't think I'll redo it because going flawless all the way up to the final save would probably not even save a minute, so the end time would be the same. Also, segment 1 through 12 are recorded via Composite cable. I then later bought an S-Video cable, so the rest looks much better. I highly recommend getting high quality for this. Overall, I really did enjoy speed running this game. Much more than I did FF VIII, but that's because I didn't have to redo it so many damn times... I hope everyone enjoys as much as I have. Single-segment New Game+: 2:48:47 by Emma Rice. I've been working on this game for about two years. I picked it up right after AGDQ 2012. The route certainly went through some drastic changes over time. It went from using the Alchemist mix ability (which was a terrible idea), to using items, to using items and catnip, and ultimately using five Iron Dukes. Originally I had the world record back in September 2012 but the run was rejected due to poor video quality. That was my own fault. So I struggled with getting a recorded run before the bounty ran up. Unfortunately I didn't get a recorded run and the bounty expired. New Years Eve 2012, I learned that there was another new game plus runner. Jisaku. My nemesis for about a year and a half. The man who used five Iron Dukes. The man who had the world record by two minutes. Needless to say, I didn't like him. He had no desire to submit his run. That's fine but at the time, I was burning with anger. Women, got to watch out for them. I was not keen on the Iron Duke strategy but I knew it worked. Eventually I stopped being hardheaded and got to work. I once tried a three Iron Duke strat. Failed. I started routing a four Iron Duke strat. Didn't even try a full run and decided to go get the fifth one. I was never able to finish watching Jisaku's run because Twitch didn't load the video all the way. So I had to bullcrap my way through. I was doing well but some parts of the run didn't go well. Luckily Goran360, a new game X-2 runner, came in and helped out. He said to use Dark Knights for Rikku and Paine. Originally I thought it was a stupid idea but it worked since Lady Luck was doing way too much damage to Yuna because I learned their Critical ability in a previous playthrough. He also helped with the equipment for the girls. So all in all, this new game plus run is filled with Jisaku's strats and Goran360's suggestions. Thanks to both.